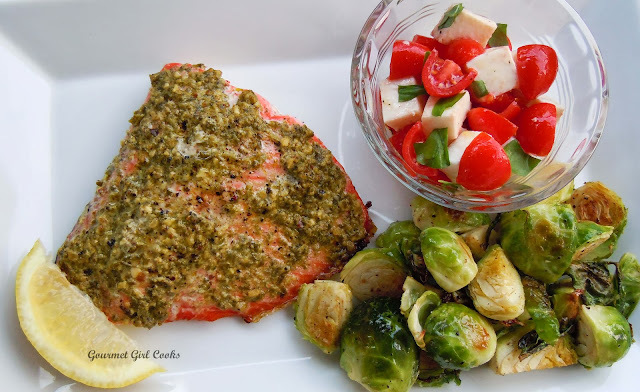 This evening I made a simple dinner of Pesto Roasted Salmon, Roasted Brussels Sprouts and Mini Caprese Salad. 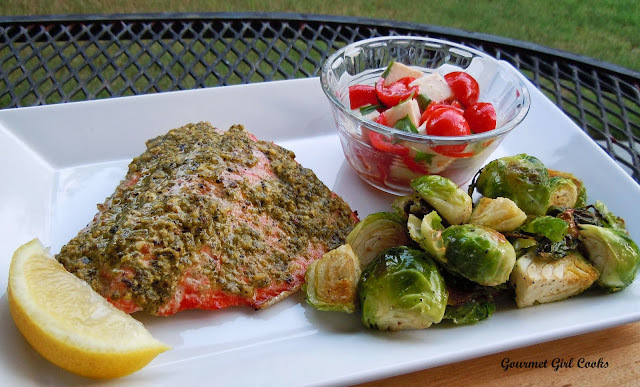 The salmon is so easy to make...it is simply a salmon fillet that has been brushed with pesto (I use Mezzetta's Home Style Basil Pesto) and roasted for about 12 minutes in the oven, covered and allowed to sit for about 10 minutes. The brussels sprouts are also roasted in the oven for about 15-20 minutes, depending on how large they are. They are simply seasoned with salt and pepper and tossed in olive oil before roasting. The "Mini Caprese Salad" is simply a quick and easy version of Caprese salad that is diced fresh mozzarella cheese, diced grape or cherry tomatoes, tossed with extra virgin olive oil, torn fresh basil, sea salt and a few grinds of black pepper. It took about 30 minutes to put this simple but delicious meal together. I snapped a couple photos for you to see below. Enjoy!